Today we’re going to take a look at the differences in how Artists are handled in Selector Versions 12 and 15 as compared to the role played by Artists and Vocalists in GSelector. This is one of the more profound ways GSelector and the legacy Selector systems have diverged. GSelector provides a much more powerful architecture for controlling Artist scheduling, but to get the most use of the new capabilities you first have to understand the way the system is designed. 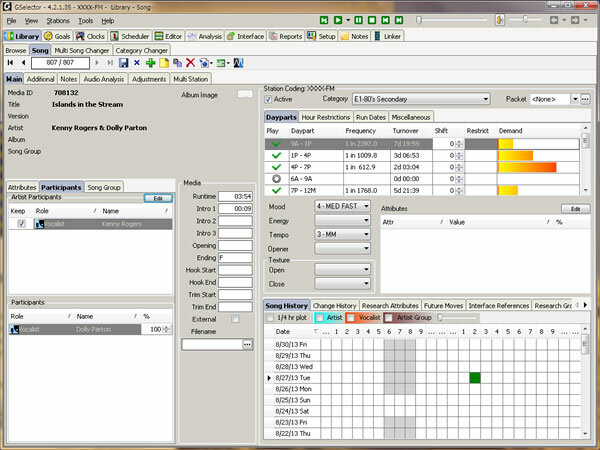 Let’s start out by taking a look at Selector Version 12. Selector Version 15 is essentially the same. Legacy Selector provided two Artist Fields. Note above how there are two artist entries for this classic duet, Kenny Rogers and Dolly Parton. These are the only fields that control Artist Separation. 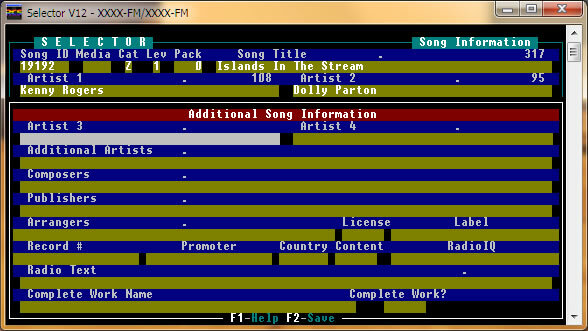 In this example “Islands in the Stream” will be separated from other songs by Kenny Rogers and Dolly Parton. Now we’ll switch to the Additional Information window. As seen above, legacy Selector also allowed you to enter Artist 3 and Artist 4; however these entries were for information only. The older Selector systems did not separate songs based on the contents of Artist 3 or Artist 4. This model worked quite well for over 20 years. Of course there was the occasional oddball song with more than two artists, with “We Are the World” being an extreme example, but programmers typically made manual edits to avoid artist conflicts. Now let’s look at some key differences in GSelector. Here’s “Islands in the Stream” as the song appears there. Notice that the Artist shown in the upper portion of the left pane is “Kenny Rogers & Dolly Parton.” In GSelector, the Artist name is merely a string of characters. It can be printed on your paper logs, sent to your playout system for display in the studio and/or delivered to electronic billboards via RDS. A huge difference between GSelector and legacy Selector lies in the fact the Artist in GSelector is for informational purposes only. There are no scheduling decisions made on Artist. 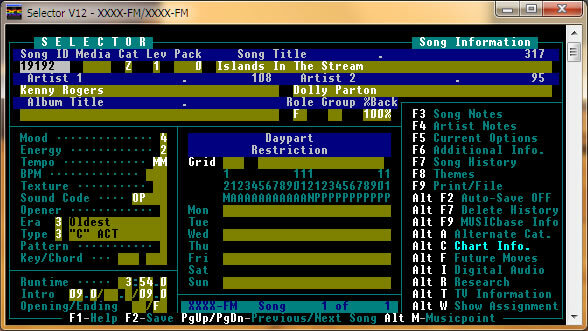 Let’s zoom into the lower left pane in the GSelector song window. Here we’ve opened the Participants tab. Note how there are panes for Artist Participants and Song Participants. In this example the Artist Participant is Kenny Rogers, who received “top billing” for the song. We have coded his role as Vocalist. Other Role choices are Arranger, Composer, Conductor, Musician, Producer and Writer/Lyricist. The Song Participant is Dolly Parton, since she is related to Kenny Rogers only in the sense that she collaborated with him on various songs rather than having a permanent performance relationship with him. Let’s bring home this distinction by looking at another song, “Hold Me” by Fleetwood Mac. In this GSelector database the Artist Fleetwood Mac has four Artist Participants – Christine McVie, Fleetwood Mac, Lindsay Buckingham and Stevie Nicks. There are a couple of non-obvious points to be made in the window shown above. Anytime you edit the Artist Participants of a particular Artist all songs by that Artist are instantly updated with your change. When you add or edit an Artist of any song all of the Artist Participants of that Artist are automatically added or edited according to your change. You can have an unlimited amount of Artist or Song Participants per artist or song. If you’re thinking Artist and Song participants eliminate the need for Artist Group in GSelector, you’d be almost 100% correct. There are a couple of fringe conditions only Artist Groups can handle, such as separating songs by John Lennon and Paul McCartney. 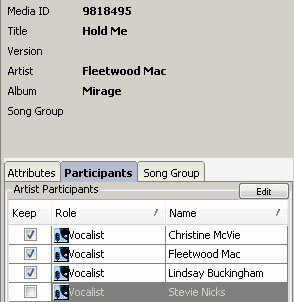 You can deselect, on a song-by-song basis, the Keep checkbox, as we have done for Stevie Nicks in the example above. When a Participant is deselected, they are ignored when separating the Participants of that particular song. Since Stevie Nicks sings only background vocals on “Hold Me,” we have made the decision to not consider her as a Participant of this song for scheduling separation purposes. 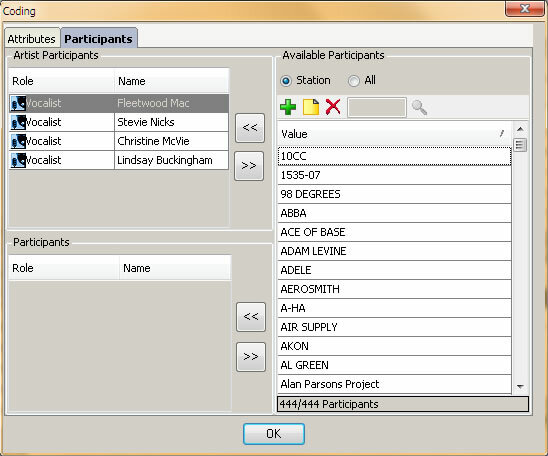 You can add and delete Participants here and assign various Participants to the Artist or Song. Press the F1 key to get full details about working in this area of GSelector. 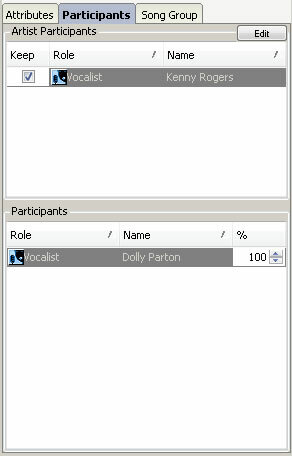 Note that GSelector does not distinguish between Song Participants and Artist Participants when separating Participants during scheduling. When you are using the Vocalist Spread goal each Vocalist is separated, regardless if it is an Artist Vocalist or a Songg Vocalist. Now we’ll look at an advanced feature of Vocalists. Navigate to Tools | Global Settings | Artist to Vocalist Settings. In this dialog box you can define delimiters which GSelector will use to locate individual Vocalists in an Artist String. This parsing will take place when you add an Artist to a song. Above we have defined delimiters of /, & and f/. So if we added a song and enter an Artist name of Sean Kingston f/ Chris Brown & Wiz Khalifa, GSelector would assign Vocalists of Sean Kingston, Chris Brown and Wiz Khalifa. If the Vocalist does not already exist, GSelector will create it. 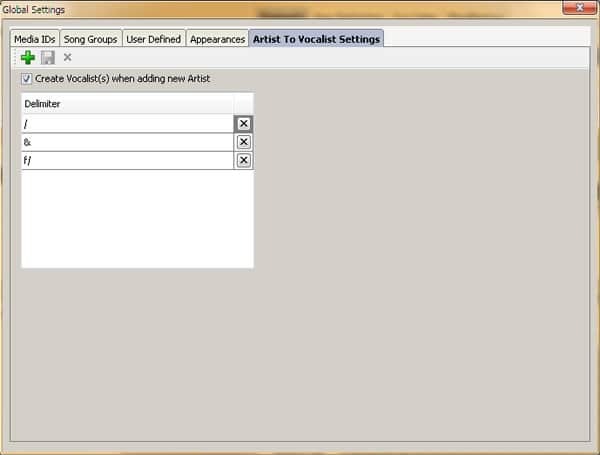 Defining Vocalist delimiters can really speed up your work when entering or editing Artists in GSelector. We’ll close by showing you a very powerful Vocalist feature in GSelector that is particularly suited to Urban, Hip Hop and other formats where many artists appear on other artists’ records. Below you see the Participants tab for the song “See You in My Nightmares” by Kanye West featuring Lil Wayne. As you would suspect, Kanye West is the Artist Participant while Lil Wayne is a Song Participant. Note however the % setting of 20 for Lil Wayne. Here we’re saying that Lil Wayne has a limited role in this song. We estimate it at 20%. When testing Vocalist Spread for Lil Wayne against this song, GSelector will reduce the spread requirement by the reciprocal of the setting. The reciprocal of 20% is 80%, thus another Lil Wayne song could be scheduled 80% closer to this song as compared to another song where Lil Wayne has a participation of 100%. This makes it easier to get songs scheduled by artists having much collaboration with other artists.The addition of Vocalists and other Participants to GSelector has taken the process of artist separation to a whole new level. Now that you understand how it works, it might be a good time to look through your library to maximize the coding of your songs.In future articles we’ll examine other ways in which GSelector breaks from the past to give you superior scheduling control.